You know, I was thinking the other day what it must have been like for Jesus and John the Baptizer, what it must have been like to read about themselves. Jesus and John were both Jewish men. They would have studied the Torah and other books of the old testament. When he was child did Jesus understand the prophets were writing about him? Did John know that Malachi, The Messenger, was writing about him? How long did John know that he was a messenger, preparing the way of Jesus? Did, knowing this change how they acted? Did they refine their approach to meet the needs of the day? Let us pray: Eternal One, guide us out of our ruts today. Away from the worries outside this building and into your house. Keep our hearts open to hear familiar words that will fire us up as strong as smelter’s fire. And through this process, grant us the courage to share our new, fired up selves, with others. May the words of my mouth and the meditations of my heart be acceptable to you, now and forever. Amen. Has anyone here worked with a forge? Even been around glass blowing ovens? Heck, even pizza ovens are hot, hot, hot. So, when Malachi described, ‘the one who is coming,’as “like white-hot fire from the smelter’s furnace. He’ll be like the strongest lye soap at the laundry. He’ll take his place as a refiner of silver, as a cleanser of dirty clothes. He’ll scrub the Levite priests clean, refine them like gold and silver, until they’re fit for God, fit to present offerings of righteousness. Then, and only then, will Judah and Jerusalem be fit and pleasing to God, as they used to be in the years long ago,” I can understand that we should envision an extremely difficult evolutionally process. Were you transformed through Christ with only one life experience? Metals are not completely reshaped with one hammer stroke, but by many. And often must go back into the fire to reshape and mold. Are you truly in a phase of complete refinement: also known as compassion and love? https://www.poemhunter.com/bryant-harrison-mcgill/biography/ Less negativity – more love. There is a strong element of judgement in both Malachi and Luke scriptures this morning. If we think other people need to have their rough edges smoothed out, spiritually and behaviorally, that necessarily infers that there is something that needs to be changed in them; that’s judgement. Yet, we’re not supposed to judge others. We are supposed to work towards compassion and refinement, openness and pure hearts. Think of refinement as a purification. Purification is a spiritual process based on practices. It’s like cleansing even; using warm soapy water to clean jewelry so it sparkles and shines (refinement) but will dull all too soon, the smell of freshly laundered sheets (purification) that will get dirty again, or the feel of a newly bloomed rose on your fingertips (transformation) that will eventually fall to the ground, the sound of silence as you meditate (contemplation) that is crushed by a police siren, and the first taste of the season of your favorite holiday cookie (contentment) savored yet you can never get it back. Even if you eat a dozen cookies. Our lives are enriched through these fleeting experiences. We can judge them good and appealing, but they are not eternal. Not eternal like God’s love and compassion as he walks with us. Still they help us prepare the way of the Lord. The way to us, through us and out to others. Even the telling of God’s compassion in our very own lives, without cookies and shiny rings nor bleached sheets and rainbows, even without those experiences, we can share the Good news. We will be transformed, refined even and purified each time we share. And refining doesn’t just change our outside appearance; it strengthens us from inside, changes our very core. Even refined men and women of yesterday may have changed their appearances but not their hearts. Changed hearts are purified hearts. If we are open to the Holy Spirit’s fine-tuning, these experiences can be transformative. And it’s through these experiences of refinement, purification, transformation, contemplation, and contentment we get closer to righteousness, right living. We prepare the way for the coming of the Lord. We become, not just ‘one crying out in the wilderness,’ but many singing Glory Halleluiah. Because, to be quite honest, far too many folks are living in political and spiritual wastelands. Many true and committed believers are refining, firing up, the social, economic, and political order that keeps us from being the messengers of hope, the Elijah’s of our day. Consequently, and I mean the word literally, as a consequence, we must become the refined gentry who not only change our outer appearances but our inner hearts and thereby change the world. Let, let me just add one more point, related to Luke. It has to do with repentance as part of the refinement process and what we’ve been looking at in The Redemption of Scrooge. I read this commentary from today’s lectionary resources on the Discipleship Ministries website. “John preaches “a baptism of repentance for the forgiveness of sins.” Repentance can too often be thought of as a one-time experience. Rather, John Wesley (the founder of the Methodist movement) taught that ongoing repentance is typical and necessary for the growth of believers (see Sermon 14: Repentance of Believers). As we grow closer to Christ, we recognize more of our faults and limitations; how tight sin has its grip on us, and how much more we need the grace of God to become what God would have us to be. Rather than a sign of weakness or that our life is not going well, responding to God through repentance is a mark of growth and a willingness to more fully rely on God’s grace.” Repentance to acceptance to forgiveness to refinement. This is our course to chart. So, in closing, as humans, we constantly grow, learn, incorporate life experience, learn to cope, learn to love and learn to hate, unfortunately. But I hope this Advent, that as we warm ourselves against the winter cold in front of fires or heaters, that we take time to refine our spirits with the fire of Christ. May you feel the heat, even if it is only through a strangely warmed heart. 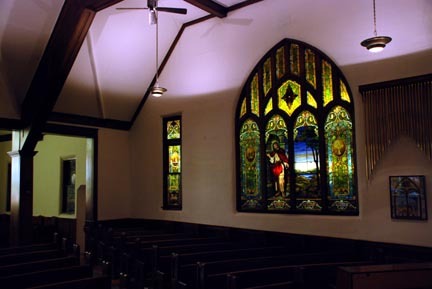 One of the Stain Glass windows in our Sanctuary. Worship God with us at Glendive United Methodist Church. Glendive Summer Worship in: June will be at UMC at 10 AM. July Worship will be at UCC at 10 AM. August will be back to the UMC at 11:00 AM. Wibaux Summer Worship will be at 8:00 AM. Our church is part of the regional UMC Mountain Sky Conference.